In October 1975, the Ontonagon Lighthouse was placed on the National Register of Historic Places. 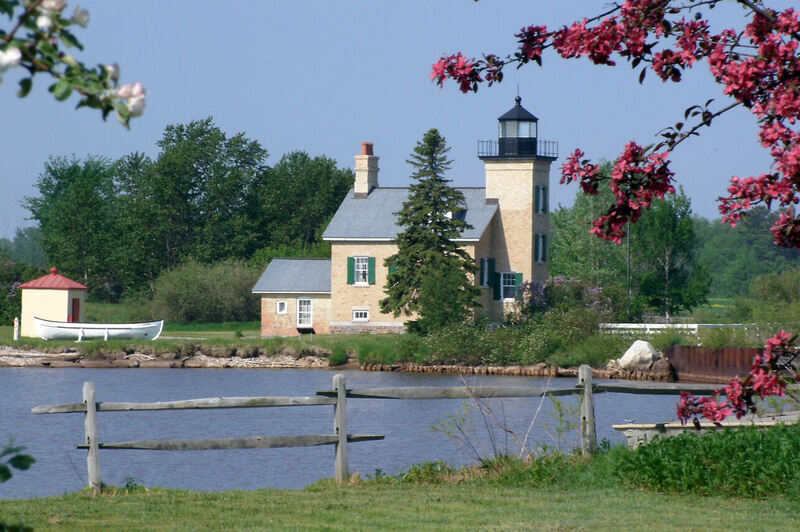 In December 2000, President Clinton signed the bill giving the lighthouse to the Ontonagon County Historical Society. In August 2003, the Ontonagon County Historical Society received ownership of the Lighthouse. The U.S. Department of Commerce, Lighthouse Service, acquired the land for the lighthouse in 1847. The money for construction was appropriated in 1850 and the first structure was built in 1851-1852. By 1866, the original wood structure was replaced with the existing building, a simple one and one half story, rectangular, cream brick building with a square light tower at the North end. The extremely high basement was built to protect the living areas from flooding. In April 1963, use of the lighthouse was discontinued after an automatic foghorn was installed in the West Pier Light, and a battery powered light was installed at the end of the East Pier. The lighthouse was officially decommissioned on January 1, 1964. Arnold Huuki, the last lightkeeper, was given a lifetime lease on the building. The light and 5th order Fresnel lens were removed and are now at the Ontonagon County Historical Society Museum. In the 1840’s there were very few ships plying the waters of Lake Superior, the greatest of America’s inland seas, and the vast mineral and timber resources of the region were only now being identified. In Michigan’s Upper Peninsula, the float copper in the Keweenaw Peninsula area as well as the great iron ore deposits of the Marquette range were only starting to be developed. By 1850, the first of the Soo Locks was being planned, and indeed was completed in 1855, which opened the resources of the Lake Superior basin to the world. A whole new era of great lakes navigation was dawning. In those earlier days of navigation on Lake Superior, ships were still guided by stars and landmarks. Radio beacons and radar were a century in the future. 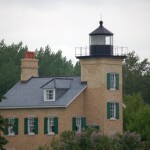 The United States Lighthouse Service, which had established lighthouses along America’s seacoasts and in the lower lakes, was even now preparing to establish light stations along the American coast of the greatest of the Great Lakes to guide ships which would bring development to the lakes country and America’s northern frontier. America’s first mineral rush began in earnest with the opening of the Copper District in Michigan’s Upper Peninsula to the prospectors and mining developers following the Treaty of 1842 with the Ojibwe nation. Suddenly there was a great need for navigational aids. Among the first five lighthouses established on Lake Superior was the one at the mouth of the Ontonagon River, the largest river that flows into Lake Superior from the south shore. In 1851, a wooden lighthouse was constructed on the west side of the river’s mouth to guide ships to the port from which copper was being shipped from the mines upriver. In 1857, the Winslow Lewis light was replaced with a 5th order Fresnel lens, the latest thing in lighting technology. At that time, there was a sand bar across the river’s mouth, so only smaller craft could enter the bowl-shaped harbor (the name Ontonagon is a corrupted Ojibwe word that infers a bowl or bowl shape). With the opening of the first Soo Lock in 1855, shipping volume increased dramatically. Permanent breakwaters were constructed at Ontonagon, the sandbar was dredged out, and Ontonagon became the busiest port on Lake Superior. A new lighthouse was planned during the Civil War, but the actual construction didn’t take place until 1866 when a yellow brick structure in the “schoolhouse design” replaced the earlier lighthouse. It was this lighthouse, which would serve as the sentinel to the Ontonagon Harbor for over a century. The early lighthouse keepers were colorful and resourceful. Thomas Stripe, who served as keeper of the Ontonagon Light from 1864 to 1883 was a diminutive Irishman who had lost his right arm in an accident with a cannon during a 4th of July celebration. Stripe was a noted pugilist, and in his younger days had been instrumental in saving the town from starvation by leading an expedition of three dog sleds to Eagle Harbor to retrieve critical supplies dumped on the dock there by the last supply ship as the lake was freezing over in 1855. The longest serving light keeper was James Corgan who tended the light from 1883-1919. Corgan came from a long line of lighthouse keepers and became a community fixture, serving not only on the local board of education, but also as the Village’s Mayor and as a Federal Marshall. Corgan’s tenure saw the lighthouse become the center for navigational activity in the Ontonagon area. The pier head light was installed in 1890 and added to his responsibilities, as well as the navigational lights on the new swing bridge that was built to span the Ontonagon River in 1891. Corgan and his family fought valiantly and successfully to save the lighthouse from destruction during the 1896 fire that totally destroyed the Village of Ontonagon. The Ontonagon Lighthouse has seen the passage of several ships into the twilight time of legend. The Sunbeam, the St. Clair, the Manistee, all of which passed this light and sailed off not to be seen again. The lighthouse has also seen the destruction of ships in the harbor itself — the City of Straits and the Thomas Quayle, both destroyed by fire in the harbor. In 1879 the Ontonagon River Improvement Company, using a dam installed at Glen Falls (Victoria), proved that log drives could be used successfully to transport logs down the Ontonagon River. This practice created a large logging and lumber boom that lasted for over 30 years. This made the Ontonagon Harbor one of the busiest ports on Lake Superior. Lumber companies with land holdings upriver and mills in other locations used tugs to raft logs from Ontonagon across Lake Superior to their mill sites. 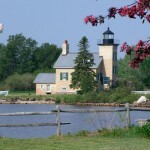 The Ontonagon Lighthouse was situated at a most advantageous position for an early lighthouse. It was discovered by early mariners that a lantern suspended from the steeple of a Church located high atop a hill at the town of Rockland, a center of copper mining activity located 12 miles inland, could be seen from some distance out on Lake Superior. By aligning the Church light with the Ontonagon Lighthouse, ships could steer straight into the Harbor at night! As it turns out, the Church on the Hill at Rockland, the Ontonagon Lighthouse, and the west pier are almost exactly at the same azimuth of 323 degrees from true north, a most fortunate coincidence for early navigators who were trying to make safe harbor in the dead of night. The Ontonagon Lighthouse, which has been on the National Register of Historic Places since 1975, is open to the public six days a week and tours are conducted from the Ontonagon County Historical Society Museum located in the downtown section of the Village. Yes! Visitors are taken up to the lantern room for a great view of the lake, harbor, and the unique profile of the Porcupine Mountains 20 miles distant. There are also historical maritime displays, and a convenient gift shop at the museum complex. While on your travels, make historical Ontonagon one of your many stops, visit our museum, and take a tour of the historic Ontonagon Lighthouse. Lighthouse Tours 11:00 a.m., 1:30p.m., and 3:30 p.m. Monday through Saturday and by appointment. Accommodations: Numerous motels and cabins throughout the area as well as the River Pines Good Sam RV Park, and the Ontonagon Township RV Park. The Ontonagon Marina also has full service docking facilities. Ontonagon is only 18 minutes from the Porcupine Mountains Wilderness State Park. 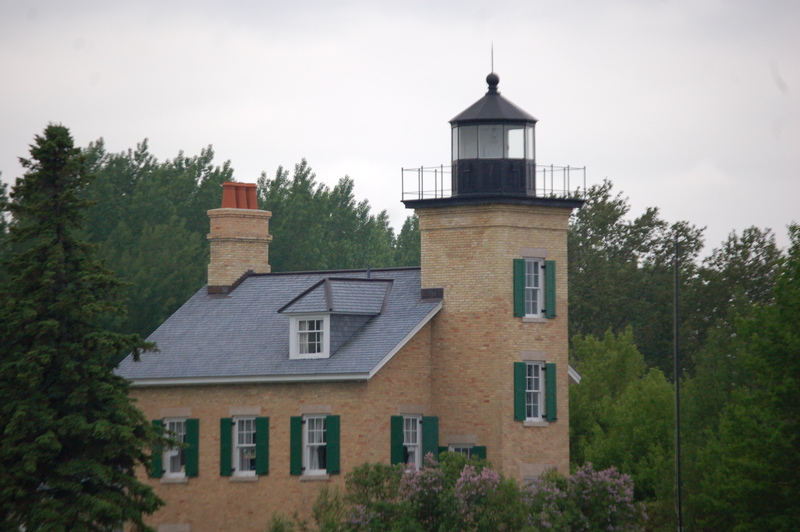 Lighthouse Toursare available May through September, Monday – Saturday at 11:00 a.m., 1:30 p.m., and 3:30 p.m., originating at the Ontonagon County Historical Society Museum at 422 River Street. Tours are also available on Sundays at 11:00 a.m. and 1:30 p.m.